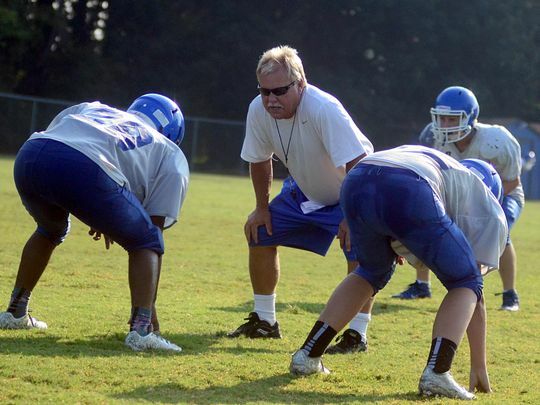 Coach Jeff Porter begins his 32nd season as the head coach of the White House Blue Devils, and his 36th year as a football coach at White House High School. His career record is 263-121 (.685 winning percentage), and his teams have made the postseason 28-of-31 years he has been the head coach. Coach Porter won his 250th career game in 2015 and now ranks as the winningest active head coach in Middle Tennessee football, and among the leaders state wide. He was third on the list in 2016, but Sam Harp of Lebanon (332 wins) and Craig Clayton of Hillsboro (284) both resigned in 2016 to return to their native state of Kentucky to coach. All of Coach Porter’s wins, however, have come in-state at one school. The Blue Devils are coming off his third undefeated regular season, joining 1997 and 2004, as the 2017 White House squad became the first team in TSSAA high school football history to go from 0-10 to 10-0 in a span of one year. However, the Region 5-4A champions were cut short in the second round of the playoffs. He has the most wins in any sport in White House High School history and the school’s longest-tenured coach. On the current staff, he coaches linebackers as a primary position. He has three former players on full-time staff: offensive coordinator Ryan Hamilton and assistant coaches Kevin Jackson and Bryce Bumbalough. His former player and coach Chad Broadrick is now the head coach at East Robertson, and the Blue Devils will play the Indians in week one of the 2018 season. Last year against East Robertson was the first time Coach Porter was on the opposite sideline of a head coach who is a former player. In 1997, he led the Blue Devils to the Class 3-A state championship, the first athletic state championship in WHHS history, with a 15-0 season and 30-20 victory over Memphis Melrose. In 1997-98, he coached the team to a school record 21 straight wins. The 2012 and 2013 Blue Devils were the District 9-AA champions and made five consecutive appearances in the Class 4-A quarterfinals from 2010-2014, plus seven of the last 10 years into the third round the postseason. He lives in White House with his wife of 30 years, Elizabeth. They have two daughters, Haley (Brad Edwards) and Lacey. Porter obtained a B.S. in Health Education from Middle Tennessee State University and a Masters from MTSU, with a plus-30 from MTSU and TSU in administration and supervision. He played high school football at Gallatin High School and college baseball at Volunteer State. Coaches profiles written by Kris Freeman for White House High School High School.